Sep 05, 2016 Hi there - All of LeafFilter’s installers are trained and local professionals that focus solely on gutters; we strive to provide the best possible experience for our customers, ensuring that your gutters are properly cleaned, realigned, and LeafFilter Gutter Protection is properly installed. There are many different factors that go into the price of LeafFilter, such as inside and outside corners on your gutters, number of stories on your home, and if you need gutter replacement. This link may able to help you further: http://www.leaffilter.com/leaffilter-pricing/. It is our mission to get our customers the best possible price on our product, which may require consultation with one of our managers. If you would like to discuss your situation further, please reach out to our corporate office. -Puts down the other competitors and shows you how theirs is better. -Says they have a job in the area tomorrow and tries to get you scheduled quickly. -No set price per foot. Starts off very high to gauge you. -Calls "manager" on speaker phone to negociate prices. 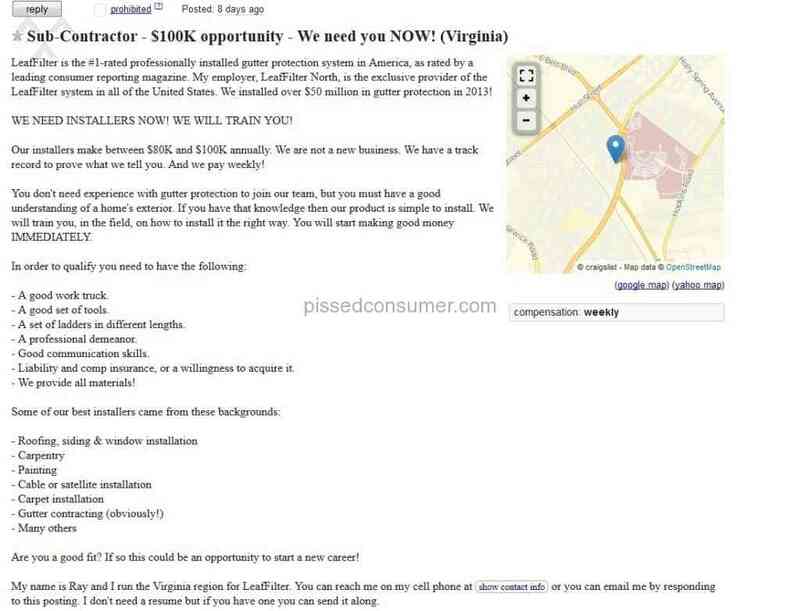 Says he is tryng to get you on a commercial price. -Does not provide a business card or contact information. -Price is for cash only. Says he needs to charge more for credit card. -Shows you how great they rated in reviews such as Consumer Reports. -High pressure to get you to sign the contract. -Says they were the inventor of the micro mesh technology. -Kept talking about the 50 year silicone they use. -I could tell he had no experience with gutters/roofs. -Started getting desperate when I said no. Sob story about his family. -Took up the whole kitchen with his ***. -Didn't care that he was encroching on our dinner time. -No logo on vehicle or uniform representing Leaffilter. -Drove from 3 hours away to meet. I would love to hear from actual sales people to add to the list. 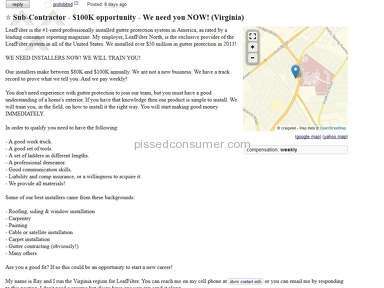 I am sure you are trained on such tactics and forced to make a sale at any cost. A legitimate company wouldnt put you through this. Review #554015 is a subjective opinion of User554015. I am a sales representative for Leaf Filter and I would like to comment on your post. First, we would have never came to your home to give you a quote if you hadn't invited us. We are certainly not trained to "put down" competitor's products but we do show you how we are better. We do assume that you are looking for the best gutter protection available. Most people want to shop around, so we try to provide as much information as possible while we are there so that you are ale to make an informed decision. We should never tell you that our installers are employees. They are factory trained and work strictly for Leaf Filter installing the Leaf Filter gutter protection system, gutters, and some fascia and soffit work. There are times that we do have jobs in the area fairly soon after a customer purchases Leaf Filter. We are a very large company and we attempt to install as quickly as possible in order to keep the jobs moving. If we have the available crew and you want the installation done, why not get it installed right away? Most customers see this as an advantage. There is a "set price per linear foot" but there are many variables such as height, size of gutters, miters, any extra work such as trimming back tree limbs, fascia replacement, soffit replacement etc. Just as you can purchase items at the department store at full retail price or sale price, we do offer promotions and attempt to make our product affordable as the opportunity arises. We always start at the full retail price because it is the actual price of the product, services, and warranty. That price is good for one year. From there, depending on how soon you would like to install, we will look for any available incentives or discounts that we can. There are times when we may have a commercial job in the same size/color that you would want installed on your home. In this case we do not mind billing your project out along with the commercial job in order to give you bulk pricing and save you money. When the manager is called, it is truly to find out if there is a job available to do so. If a rep puts the manager on speaker when this call is made, it is most likely so that the customer doesn't feel that it is a fake call. We attempt to be as transparent as possible. All sales reps have business cards and we do provide Leaf Filter apparel and badges. I apologize if your representative did not use these items. Representatives are 1099 employees and do use their own vehicles as is the case with the majority of home improvement companies. A lot of times our discounts are cash only discounts because as we all know, credit cards charge 3% to 5%. When we get into commercial pricing, we simply do not have the ability to absorb the cost that the credit card company will charge us. Again, we attempt to be transparent. This is the same reason that a lot of convenience stores require a minimum purchase in order to use a credit card. We are rated as the best gutter protection by consumer reports as well as bottom line secrets, the fact that we share that with a potential customer isn't a negative. We take great pride in our product but we also realize that if you have 50 gutter protection companies out, you will have 50 that will say that they are the best. We simply show you the consumer reports review so that you can sift through the sales pitches and see what an extremely trusted 3rd party source found when they tested. Again, we try to be as informative as possible. Again, we wouldn't be in your home if we weren't invited. 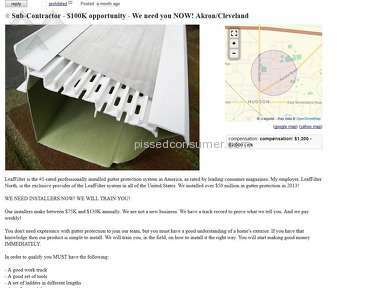 The fact that you had us out leads us to believe that you have issues with your gutters and are looking for a solution. When we arrive, we do expect the customer to have an interest and we also realize that it will usually always come down to price. When we see that you do indeed have issues that need to be taken care of and that Leaf Filter will resolve, we do our best to make our product affordable. Gutters that aren't working properly can cost far more than the price of Leaf Filter if left alone. If it seems that we are pushy, it is probably the rep realizing the urgency of your issues and conveying that to you. A lot of consumers do not realize the importance of gutters and the role they play in protecting your home. Some even remove the gutters completely. We have found that it is necessary at times to remind customers of the urgency and this may come across as pushy. You should not have been told that we invented micro mesh technology. We didn't. We simply used it to invent an extremely effective gutter protection product. We do use 50 year silicone. It is a very important part of the service that we provide. Most gutters are sealed using a caulk of sorts that will start to allow leaks within a year or 2. The use of 50 year silicone is unheard of in the gutter industry and sets us apart from anyone else. We do not see telling you the value of the service we provide as a negative. I'm not sure how you "could tell" that he had no experience with gutters or roofs but we do provide extensive training. Our representatives are commissioned which is a common practice in home improvement. I'm not sure if you ever had a professionally installed gutter system installed on your home but I am 100% positive that the rep who sold you that system was commissioned as well. It is simply a way of paying them for their work and again, isn't a negative. It sounds like the rep that came to your home was trying a bit too hard and was quite possibly new to the company. Was the "sob story" just a conversation or a way of trying to get you to purchase Leaf Filter? No offense at all but it seems that you were looking for a negative in every move he made. When we come in to do a presentation we do bring a kit that includes competitors products as well as ours. We want to be able to show you what is available and how it compares to Leaf Filter. Again, the fact that we are there leads us to believe that you are at least somewhat interested in what we have to offer. It is our job to provide beneficial information to you. This can take up some room in the kitchen/living room etc but we will never leave a mess and are always attempting to help you make a decision. Did you tell the rep that he was interfering with your dinner time? If you agreed to the appointment time, we have no reason to believe that you haven't set aside the time needed for the appointment. However, it is not our practice to be rude. Our reps cover a large territory. This may include a long drive time. This is not an inconvenience to him or to you. It is our job. We take every opportunity seriously because we are a respectable company who values our customers and potential customers. In closing, it sounds like you went into this appointment with a judgmental attitude, expecting to be "taken" by the rep. He may have been new or even a little pushier than most. But please remember that he really is trying to make a living. If any company you have ever worked for stopped being able to provide their services or stopped making a profit, the paychecks would stop. We have thousands of very happy customers and while I apologize for your experience, it is in the extreme minority. Our happy customers out number our unhappy customers 700 to 1. In this case, I do not believe that you were considering the product. It seems that you were simply observing what you felt was a pushy sales pitch. Its all interpretation as they say... Thank you for the opportunity and we hope you will consider Leaf Filter in the future. This is true of the salesman. Every word of it. I could never get him to give me an exact break down of item cost. He would dance around the question. High pressure sales pitches and quick installment/right away. I paid $6000.00 dollars for it for 119 feet of guttering. I still think that is too high but they assurred me of the life time warranty, free gutter cleaning, transferable warranties. We'll see if they come through. The contractor who installed the gutters actually did a really good job and the gutters look good. I'm worred that I may have been raped on cost. Six grand is a lot and I think I was took. The sales person told me they charge 28.00 dollars a foot and the cost of labor plus commission. They said it is the surgical mesh that's expensive. The actual gutters was 10 dollars a foot. Do the math. There's no way I should have paid the six grand. I did however and got the guttering. These reviews are scaring me. I hope I'm not the fool here. But, some of us get more than one estimate before we make our decision. It is our money, after all. We are allowed to take our time. There are lots of companies in any given area doing the same thing your company does. You could always start charging for those "free estimates". The funny thing is, it is so easy to install these gutter guard yourself. 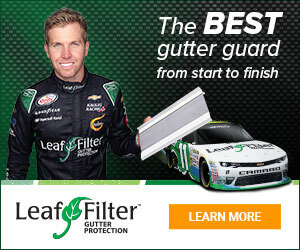 If your gutters are in good condition, you don't have to replace them, just install the leaf guard right on them. My son did ours when he was only a teenager, and they are holding strong still. If you really can't afford thousands of dollars, then do it yourself. You are ignorant. Leaf Filter is providing employment and opportunities for people like me, who otherwise wouldn't have a job. If this company didn't succeed a lot of hard working families would be screwed. Including mine! My name is Matt Kaulig and I work for leaf filter and yes I have to say we squeeze every drop of blood from our reps and our customers... We do have a exit strategy ., I am building a7 million dollar house! That house was built on a business that was founded 10 years ago. Hard work and a lot of educated people went into growing this business. Thisis wwhat's wrong with America. Why can't someone who worked their *** off and help make dreams come true for their employees live in the house of their dreams? What is so wrong with that? Some people love their product and some do not. I've bought things I didn't like afterwards and didnt whine and say but oh the salesman made me do it!!! Take some responsibility for your own choices. Clearly anyone living in a house like that made better decisions then you. I happen to work for the family and they have been wonderful and a true blessing to my family. Anyone claiming they cheat workers is lying or maybe they didn't do the job correctly or in time so they want to cry about it. Your an *** and obviously have no idea how the business of sales works do you? From cars, boats, RVs, to gym memberships sales people are always trained to GET THE SALE!!! That is how we feed our families and pay our mortgages. Maybe if buyers were not liars, sales people wouldn't have to go to such lengths to get the sale! First if you are going to take the time of a sales rep to come to your home and educate you on a product don't BS about how you were just curious about a price, if your curious look it up don't waste someone's time. The "i have to think about it", we don't make decisions the first day" is total BS! If you need it and it makes sense and its affordable there is nothing to think about if it makes sense today it will make sense tomorrow! Do you not think that it COST MONEY TO COME AND SEE YOUR SORRY ***! So yes if a rep has to make adjustments to the price to motivate you than that's what is done! If people didn't have the need to haggle every time they buy something maybe the price wouldn't start so high, did you ever consider that? Tired of people putting down sales reps, if you have no intention of buying then stop wasting our time! I understand get the sell but if your a Christian man you can't sit there and LIE like y'all do you can't say we don't use sub contractors. The subs are the ones that uphold the warranty not leaf filter I worked there for 2 yrs. and I fell into y'all's trend of lieing, and bull pooping to the homeowners. And if your like me you take pride in your home. It's the most expensive investment you make. It keeps you dry, warm, cool,. Your house is your pride and joy. And I understand GET THE SALE!. And it cost money to make money DUH!. But you DONT LIE. If you have to lie about who installs the product. What does that say for there company.and you talk about driving 3 hrs. To sell a job in your polo shirt. What about the installer who drives 3hrs. Climb ladders,clean gutters, correct homeowner about your lies, and you sells men tell these lies and expect the installers to continue tell your lie. That's like getting caught in a lie and having the guts to stand up for the Lie. Y'all lie so much that y'all believe your on lies. I don't understand why you left this review as anonymous...you are a competitor obviously since all of your comments could only come from someone desperate to criticize yet you don't leave your contact info. I had Leaf Filter install their gutter protection on my home and never experienced any of the issues you claim. No snow build up or problems with ice. I'm tired of those who submit reviews dishonestly in an attempt to spread incorrect info on a great American Company. You should be ashamed of yourself. So what are you going to do when people in America get fed up with cockroaches like you and take your house? Mmmmmmmm?